Ultralight Teardrop Trailer – For a Bicycle! Well if you didn’t think I was crazy before… let me introduce you to the teardrop trailer for a bicycle. Don’t get too excited and whip out any credit cards this is just a crazy idea and I’m certain many bicycle enthusiasts will tell me a some very good reasons why this is just plain silly… but it was still fun to draw and day dream about. The idea is simply to have a tiny habitable trailer that is lightweight and aerodynamic enough to be pulled by a bicycle. I found a few cargo bike trailers on the web but Logan at RowdyKittens pointed me toward a little company in Eugene Oregon called Human Powered Machines that makes some very stout bike trailers that can carry up to 500 pounds. Logan and Tammy at RowdyKittens have been living car-free for quite some time now. To build such a trailer you’d need to start with a heavy duty custom bike trailer that is about 8-feet long and 3-feet wide. I’d then put down a floor and erect two curved side walls made from thin plywood (or OSB) and bond a sheet of polyisocyanurate foam board to the outside. Then I’d cover the arch with more wood, build the doors and window, and finally cover the exterior with a thin layer of aluminum. Since the length is just under 8-feet and the height is 4-feet, each side wall could be cut from a standard 4′ by 8′ piece of material. The interior is long enough for a 6-foot person to sleep and their feet would tuck under the kitchen area. There’s a little shelf or cabinet inside for personal items too. Around back the kitchen area would provide a place to store and prepare food. The rear hatch hinges up like most traditional teardrop trailers. You could add a couple small solar panels on the roof but you’d probably want to spend the extra money and buy lightweight batteries. Lead acid batteries would probably become a real bummer after the first few miles. Is this totally crazy? Could this work? How can you imagine using such a trailer? This entry was posted in Design Concepts and tagged bicycle, bike teardrop trailer, bike trailer, Ultralight Teardrop Trailer, ultralight trailer. As an avid cyclo-tourist and commuter, I would say this is not totally crazy but realistically I would imagine an aluminum frame, something shorter maybe 6′ and narrower, no more than 2′ and I wouldn’t use a hardshell outer. Also it has to be more tear-drop shaped in both directions for aerodynamics. More practically, it’s still easier to carry a tent and bags for gear but it might be a welcome shelter on rainy days and to save the pitching and packing the tent every day on long trips. SteveR I think you’re right, more aerodynamic, smaller and lighter. Thanks! Cool idea. I ride a Vespa motor scooter and built a small single wheel trailer to hail camping gear, groceries, etc. I actually might give your idea a shot. I’d love to have a small lightweight camper for my scooter. If it’s going to be hauled by a bicycle, I might suggest using much lighter materials. What about the main structure constructed like a tent? It would fold down flat while traveling. You’d arrive at your campsite and quickly set it up like an easy to assemble tent. You could retain the shape you’ve drawn, but it would be made of fabric instead of metal. Just an idea. Thanks Tom… my wife actually mentioned folding to me when I first told her the idea. Good thinking! Thanks. Michael, Bike trailers to transport two children plus a few groceries are common place. Though only load carrying trailers seem to exist. I would have thought that if you took a look at the trailer tents and morphed the two concepts together a workable compromise would emerge. Thanks Mark. Great links too. 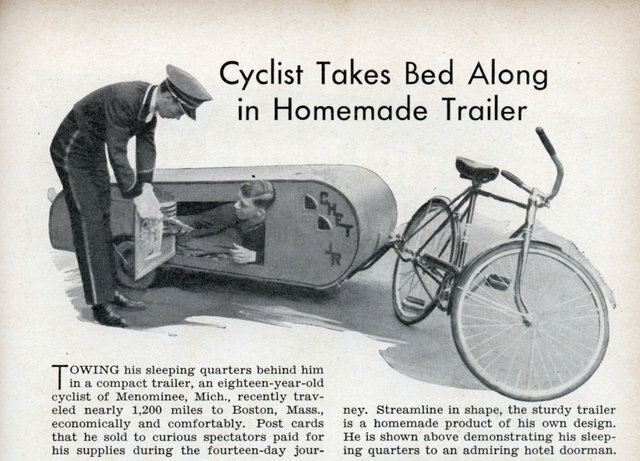 I’ve been googling for it with no luck, but some years back I read an article, complete with photos, about a guy who built such a trailer for his bike and used it to travel the country. I can’t recall the name of the cyclist nor the website where the article originally appeared, but it is out there. Martini… great links. I knew it wasn’t a ‘new’ idea. Thanks! I would like to introduce you to Steve Roberts, whom in the mid 80’s transversed the united states in a bike, while lugging all of his possessions AND a complete solar powered communication and computing center. The original Technomade. As for the teardrop, I don’t know if it would be the best idea. In order to be useful, the trailer would need to have enough space to sleep in, but that is a lot of empty space and extra drag while riding. Perhaps more of a pop up design, with a nylon or other fabric based top. I picture something that folds in thirds, the sleeping platform will in half at the center point, and then a back bookshelf sort of structure would fold on top, becoming a single hard bodied, lockable, aerodynamic trailer. Great link Grant. That guy was really ahead of his time, eh? I guess I wanted a fixed hard shell for added security and simplicity. But there are probably more advantages in making it lighter and collapsible. In fact the way you’ve described it might fulfill all those requirements: secure, aerodynamic, simple, lightweight. WOW! Totally cool Logan. Thanks for the link. That’s insane man! What a freak’n mess that Brian dude made. I mean what a mess that Frankinbike is. Did he even think of drawing it on a piece of paper before making the dam thing? I’m not knocking his effort I’m just knocking it in general. What a mad rolling wreck. Mike!! Dude!! Why?! Why do it to all us dude?! The devil is in the detail!! The devil is in that rolling mess. – The devil is in the details of the attachment to the bike frame. – You’d be better off using 3000 Denier Cordura over an aluminum tube frame. Towing an empty 50 lb trailer up a grade is no fun, towing a 300 lb full trailer is even less fun. – The sides are too high and flat, taper them to shed cross winds. Burley already makes many similar products, you may want to look at their designs for some inspiration. I agree 100% with the height/weight comments. It is nice to see that you think outside of the (tiny house) box 🙂 I am totally into bike trailers and think since a while about the definitive purpose of such a “travel trailer”… to build one one day. We will see. Thanks Andreas. It’s sounding like the pop-up is the way to go. Secure when closed and still lightweight. A sleeping bag should also provide enough warmth. This would be utterly amazing for the homeless! Especially those that don’t own a car to haul a trailer. Bicycles are relatively inexpensive and i’m sure this tiny home would be inexpensive as well! If it’s okay with you Michael, I would love to feature this homeplan on my Project Rolling Freedom site (as a free plan, of course, unless you want commission). My husband also had an idea for it. He thought it would give more room if the kitchen was near the back tire of the bike and the bedroom had a pop out tent off the back, that way you could maybe have more room for clothing storage or something. Thanks Lellewyn. Feel free to re-post. I was actually thinking homeless solution too but I actually have a better one for that cooking. I’m hoping to post that this Friday. This bike trailer would make an excellent temporary solution though. Thanks for another thought provoking design Michael. I agree with the other posters that a folding popup-camper design with fabric walls might be better for a bicycle. If one was set on a hardshell design, then maybe take a cue from the way surf boards and kayaks are built out of foam covered fiberglass. It’s very strong, lightweight, and waterproof. It could be built like a HexaYurt out of foam panels and reinforced tape to prototype it and then once you get it they way you want it, cover it with fiberglass. Tim R… excellent idea! In fact that kind of wall construction coupled with some kind of folding mechanism and even some flexible fabric pieces might make a great solution. I have seen the EDAR. Very clever solution. IMHO… It looks like great temporary solution but I’m not sure how well it secures the occupant from danger. My wife worked with homeless women and children for years and reports that they are often in incredible danger on the street. I think an enclosed locking shelter would work better for protecting the occupant but like everyone has pointed out… would be very heavy and difficult to transport. I do like this idea, not crazy at all. 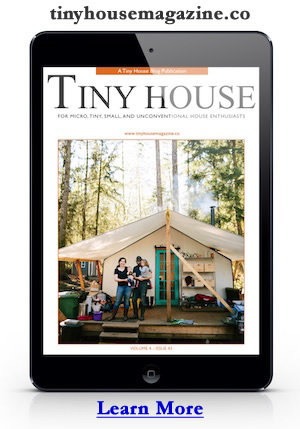 As a bike commuter and big fan of tiny homes, you have combined two of my favorite things. Great idea! Also… borrowing from the design of a climbing portaledge may be a good idea. If you wish to keep a hardshell design, why not make the bike and the camper one thereby making a HPV (human powered vehicle)? In other words, give the bike an enclosed aerodynamic design with space to lie down inside. Good thinking. The only reason I like the detached bike is for transportation while parked. Hank Raines did a small teardrop for his dogs who travel with him. A lot of your design will depend one how claustrophobic you are. Some of the simpler designs I’ve seen are basically a coffin on wheels. If you can stand it, it makes a great shelter. If you designed the front end of your teardrop to pop-up with a screen attached you could have a much more airy inerior. Great links Mo Bike’s Shop! I knew someone had to have been building stuff like this somewhere in the world. Also including Shoghi-style screens and even a stove and shower. I call it the “wearable house” but have shelved the ideas for a bit. While the width may be seen as a no go for some, I used to work with a fellow, Bart Orlando, who regularly commutes 16 miles a day on a electric assisted bike with trailer that is about that wide. He does this across a bridge on Hwy 101 with no shoulder. I would love to chat about this type of concept if anyone is interested. Brian… thanks for the link… totally cool bike! After a camping trip (in a trailer tent) I began thinking along these lines. As most have state a full/high sided trailer would be hard to pull in windy conditions. My idea was to have a plywood box shape trailer with a removable lid. 4 tent poles would then be set into each corner of the trailer, then the lid/roof would be replaced. Some kind of tarpaulin/tent material would then be unfurled from inside the roof down the sides of the trailer. An additional canopy-tented attached area would house my bike at night and also serve as a cooking area. The end result would look similar to a 4 poster bed? Having reserched this for months! there aint many trailers out there that I haven’t seen. Great stuff Tom. If you build it I’d love to see and blog about it here. Thanks for all the links too. Great stuff. My version is more like a flat-bottom boat — with the intent that it can also be used as a boat — perhaps even with a lazy-susan affair which would permit something to be draped over the bike to use as a moveable sail. Something long enough for sleeping (I’m 6’4″) with an angled back wall for comfortable sitting and reading. The only critical dimension would be the 24″ sq. opening above my head for one of those large RV-style crank-up skylight/vent covers which double as an emergency exit. The rest would be sized to fit using stitch-and-glue and 1/4″ plywood. The wheels would have plastic food-grade bearings so getting them wet is no problem. Roll my bed down to the water, crawl in and float away — safe enough and many more options for places to BE at zero cost. Jim… that sounds totally cool. Thanks for sharing that out-of-the-box idea. Your idea is not as crazy as you might think. In 2007-2009, I built a very similar house trailer for my MTB. It is 8’long by 5’7″ wide and stands 5′ tall. Weight empty is around 300 lbs and loaded I can comfortably carry another 200 lbs of the necessities with me. I do not have my site up yet but I was published in the Marysville, Ohio Journal Tribune, during my maiden voyage on August 13th 2009. It was also published in process by the Columbus Dispatch and the monthly paper Alive sometime in 2008. The articles can be searched using my name. Thanks Michael! I’ll definitely look it up. If you spot any info online or have photos of it I’d love to write about it and help tell the story. Have you ever seen the “Human Powered Housing Project”? A guy Brian has been living in his tiny bicycle for probably ten years in Davis, CA. Yes, I said *in* his bike. He’s an amazing guy. Thanks Jack… I did run across that fellow a while back but it looks like there’s a lot more info on him online now. Thanks for the info! Nice one Mike, Took me a while to find a photo (could only find the one). I’d like to see more of this bicycle home. I’d love to see more folks give this a try. If you decide to build one I’d love to post the story and photos here. I am dreaming of something similar. How about a pvc base? Not treardrops but a couple of neat looking camping trailers built by a couple of german guys. This site shows construction of the folding top trailer. Thanks Tom… great links! Love those bike trailers. If the teardrop is chopped into four “slices”, you could imagine nesting the four slices and having the teardrop fold out, similar to an unfolding cycle tent trailer but with a more solid structure. An open frame “box” on the deck the unfolds provides it with stable support, and then the wheels support the original deck. and the frame can hold gear as well as the interior of the trailer. Unhitch the bike first and unfold *toward* what was the hitch, and then the “sharp” end of the slice is pointing into the direction of travel. Quarters rather than anything finer since: (1) a round window will be in a single slice, (2) each slice is the width of the side panel narrower than the one its nested within, (3) there’s gasketing required to make the nest seams weatherproof, and quarters keeps that down to three gaskets, (4) access/egress – simplest, therefore the fewest things to go wrong on the road, is most of the end panel of the “outside” wedge (the one that swings around) swings up – the more slices, the smaller the panel, (5) with quarters, you can still have a modified version of the classic teardrop design in the back, with the back panel from that bottom slice swinging up and latching to support a food preparation shelf – sun / drizzle protection might be from some form of roll out awning. Of course, this type of structure might need the plywood/foam/aluminum sandwich to be flipped around to plywood / foam / paneling, or perhaps plywood / foam / canvas. WOW Monte looks like you are making great progress! Looking forward to seeing it come together more! I love your blog, especially the bike trailer concept. Keep building up and testing the ideas on this one. This is a natural extension of finding the extreme bare minimums (even deeper than the 9 square foot project). It has a distinct advantage that this can be parked and used in almost any outdoor location. This could provide a reasonable shelter and toilet for plein air artists, birders, fishermen, hunters and more. 1) Light weight is going to be crucial. Having some parts that provide structure and points for fastening things (acting like studs in housing), other parts that provide weather resistance (like aluminum sheeting, fabric, or corrogated plastic), and light weight insulation (to reduce cooling and heating demands, fuel and mechanisms). Light weight glass is available from racing supplies and various plastics and screening can also fill the role of ventilation and view in a much lighter way. 2) The bike itself will need beefed up brakes like those used on ATV’s and motorbikes. Gearing may have to be set up to help with the extra load of the trailer. 3) The trailer may need two configurations – (a) one when being pulled and (b) perhaps a more vertical or upright configuration when parked and being used for eating, sleeping, bathroom, etc. 4) The trailer shape may also need to be further optimized to be even more aerodynamic. Although slow speed pulling will be the greatest burden to the rider (where lower weight is most important), once up to a reasonable speed, the wind resistance presented by the trailer shape will add a huge amount to the effort to move the trailer. The Sunrayce cars have taught us that shape can be optimized and even help to push the vehicle and drastically cut drag from wind resistance. The trailer will need brake lights, slow vehicle warning lights, and turn signals. Here is a very simple camper trailer. Also on the website pedalrv.com you can see a pedalrv in the travel pics section that is pedaled and motor powered too. I has been a real nice way to see the country inexpensively. Totally cool Robert. Thanks for the link! Great idea for a trailer! There are a lot of good comments regarding the design, I think the hard part is making it lightweight yet durable. The idea about making part of it ‘pop out’ could be worth a second look as you might be able to design the trailer with a lower centre of gravity and improved aerodynamics. I’ve only had experience of ‘manufactured’ trailers but they can be a lot of fun! As someone who bicycled across the country in 42 days I will tell you that your plan is the wrong vehicle for bicycle camping. At the time I weighed 110 lbs and rode a 25 lb bike. With that amount of weight I climbed hills at 5 mph. I was shooting for 100 miles per day and averaged 85. What you propose might be good for someone moving shorter distances or once in awhile. maybe a young agricultural worker on an organic farm. But they are usually given housing. Another way might be luan plywood as structure and inner liner, foil faced bubble pack, covered with waterproof nylon. My ” Pad” was an inflatable air mattress. A lightweight inflatable structure could be created with heat welded lightweight waterproof nylon. Make it tunnel shape front to back, with the “tubes” running the length also. Look at an ” A Liner ” trailer. The front and back fold down and the sides fold in. This would be heavier. Some really good ideas . But keep in mind some of us are more interested in comfort then speed . I have traveled with the same weight as you for 850 miles and did about 85 miles a day . But now I just don’t want to sleep on the ground . Just wanted to tell you all THANKS! I was looking for info on this subject and all the links and advice have been invaluable. People like you make the web a wonderful place. I would largely use coroplast for the arch roof, and as suggested, make it more teardrop shaped for aerodynamics. Also, narrow is better for something towed by a bicycle, so I’d probably make the footprint equal to a twin sized bed for space efficiency. Just frame it on around the mattress, use a futon, or inflatable for the dunnage, and build in overhead storage for everything else. The primary concern would be overall weight, as this has to be towed by muscle power alone, conceivably up hills. OSB would be fine for the floor, but everything up from that would have to be ultra-light. Bent alluminum track in two arches, corrogated plastic, or alluminised polystyrene roof, and sides. I also don’t like your circular door. It looks neat, but for practical purposes, the vast majority of containers are going to be cubiform, and it would be nice not to have to bodge them in. The size is about right, but better would be a square, flip up for a sort of awning, Or down as an external table/ramp. Traditional teardrop designs have the hatch back kitchen, but this would be a structural atrocity for a cycle version. The arch shape’s structural efficiency is robbed by adding a corner to the interior space, which is far too limited for this volume. For cooking, I respectfully suggest an open fire pit, or camp stove used outdoors. This is, after all, a camper, and modules designed to pack in everything including the kitchen sink would double the overall weight, each. Take care of sleeping with the shelter, and the rest can be packed in gear. Latrine tent, camp stove, et cetera. You don’t like it, spend the money, and waste the fuel for a deizel pusher. Otherwise, make it light enough to tow with a bicycle. Any heavier, and a rikshah foot drive might be neccisary. I’ve thought making a cyclist caravan myself and would love to see photo’s of it if you decide to build it! How about putting some folding jack stands on the bottom of it – one under each corner. I did not read all the comments, so this may have been suggested already: more complex (say, aerodynamic) shapes can be done with “stitch and glue”, mostly done with boats so far. Could be the “low tech and far less costly lightweight option” (as opposed to lightweight alloys, fancy brazing, and so on). Use lightweight honeycomb panel for floor (aluminum if possible)–other honeycomb technology is also possible. A partial-height solid enclosure with weight placed low and limited (practical) ground clearance reduces wind resistance while moving–then around its top outer edge put sockets for the flexible-pole arch supports for the tent part, erected when parked. Great find Lynn! Love it. I am currently in the devolopement phase of a trailer for a bike that will sleep one person. and it aint 8 feet long……..I have the secret to it in the back of a shop in battleground washington. we are hoping to go into production as soon as 2014……. I know I am replying to a post more than 2 years old. Found this going through old sites and files. I am wondering if you got the trailer designed, as I am interested in seeing it. Hi from the SE U.S. Is your teardrop for bicycles available? I’m quite excited about this life on a bike. I was looking to design and build a foldable house to attach to a rowbike. All the materials will be used from recyclable scrap. You and your readers have given me plenty of ideas. Fiberglass seems to be my solution for a sturdy floor. What do you think of using razor handles glued together as a floor or as walls. The size will be 8 x 10. Your design would be great for college students. In theatre sets we use a lot of a thin plywood called luan, which is generally stocked at Home Depot and runs in the neighborhood of 10 bucks for a 1/8th” x 4’x8′ sheet. It also comes in 1/4″ thickness as well. It’s pretty darn sturdy stuff, bends decently on reasonable curves, takes paint, glue, varnish etc nicely and may be a good lightweight option for the shell of such a trailer. Cool concept! i would love this, ive always liked the idea of a tow sleep trailer for cycle camping. This has actually been done and it looks like some of the other commenters have already posted the links. I don’t think the idea is crazy at all. I hope you have as much fun building and using it as you did dreaming and drawing it. I also hope you post pictures when you actualize it. John Heywood~ A man may well bring a horse to the water but he cannot make him drink. We have a winner, almost. While browsing around I came across this bicycle camper trailer made by Dethleffs. Sadly it was a prototype, a one off and wont be put into production. As you can see from the photos its hooked up to a tandam and an electric bike, which you’d probably need to haul such a big – full fronted camper. The Qtvan is designed to be towed by mobility scooters but it can also be towed by a bicycle. It is rather small and looks to be a bit topply when towed by the bike in the video. The design is more like a small Airstream Bullet miniature RV then practical bike trailer, but all ideas and efforts are encouraging. I design things for a living and build bikes as a hobby for my friends. There is folding technology that should be used for this solution and geometrical patterns which will make the enclosure bear proof. Yes I said bear proof. If your traveling country side you have to be in a shell if your out like a light and not minding your surroundings. I would design a trailer using folding technology and test it with some bears buy placing tasty food and watch how the bears shuking it open like an oyster shell and reengineer those sections and bate it again and again till they can’t get into it. Seriously. Use 1/4″ ACX shop-sanded plywood for the roof and it will bend nicely to a curve made by the sides. Use styrofoam for insulation instead. Polyisocyanurate slowly accumulates water (sorry, but true). Actually, with proper design, the foam could be the insulation and structural wall, too. Really this is a great idea, if you use thin plywood on both sides of a foam core you have a very light and stiff panel. I would use Dow blue foam or Owens Corning Foamular forget using the polyiso foam. To glue the ply to the foam use a water base contact cement so it doesn’t attack the foam. You really could get away with using 1/16 or 3/32 inch ply for skins but you would have to put cleats in the foam where you want to attach anything inside or outside. I wonder if it would be worth doing a how to on building something like this? Seeing how the idea is to tow this with a bike you need to keep it as light as you can… think small aircraft light! Do you sell the plans for this teardrop? I’ve not done any teardrop plans – sorry. I like it, Im going to build a teardrop trailer, think 1/4 ” lauan plywood covered with thin fiberglass, to keep it light the framework will be side rails from an aluminum ladder. Part of the roof will lift up, and the floor will fold out to the back and will have a popup tent section so that there is headroom when set up. Wish I knew how to use google sketchup so i could put some slides up. Your really going to need to use an aluminum undercarriage frame in conjunction with aluminum sheet siding to create a Faraday Cage effect to lightning shield it. I am loving all of the ideas here. i plan on building something for my bike.. my idea is maybe pvc pipe? i dont know, to heavy? The problem with all these covers, canvases, foams, bent thin ply wood is that though they may be much lighter to pull around with some cords through a few grommets and easier to cut out and make its not protective safy shell leaving you vulnerable and exposed both asleep or awake. I always build things like a paranoid person. “Prepare for the worst and hope for the best.” “Better safe then sorry.” And all that other silly stuff. Fun idea – but you need to rethink the whole idea. why lugg around with such a heavy house?.. when you can do it with lighter material and with tent fabric? are you afraid of bears ? 🙂 i think kids would love it though..
just remember that the strait on the wheels are serious business …. I agree some of the others have nice ideas , but it’s really pointless trying to make it bear proof or lighting proof it’s just not big enough . After all the bear or a person can just drag it away , that’s really the point of it being portable . I’ve already build a teardrop trailer from aluminum for cargo 2’x2’x4′ about 25 lbs . http://jarm13.deviantart.com/#/art/Tiny-tiny-teardrop-trailer-279581237?_sid=2ef8f511 But for my next trailer/camper I’m planing on using foam insulation for walls with some plywood reinforcing and a painted canvas top . Oh , and making the darn thing 7′ long . I’m tired of sleeping on the ground these days . WOW Looks great. Thanks for sharing the link! What about making it so the trailer could be pulled by a moped or scooter? I intend to do just what you have said would be crazy to build…! I don’t feel a bit crazy about it, as a matter of a fact there are may some what close to what some people call vardo’s out and about being pulled by bicycles and tadpole trikes… Which I will be pulling my trailer with.. I hope you don’t mind but I will be using your mock up drawing as one of my examples to build this crazy teardrop trailer… When I have it built and towed about a while, I will post or send you some pictures of the project…!